Bilateral economic co-operation between and Punjab state and province of Ontario (Canada) today got a boost when Canada based IT firm Kitchener evinced keen interest to invest 100 million dollars in IT Park Mohali to establish data centre services even as an MoU was inked between both countries to further this cooperation.Treading on road to bilateral co-operation and to give fillip to dialogue and exchanges in various fields with specialized focus on trade and commerce, province of Ontario and Punjab today inked a MOU which emphasized working together to advance mutually beneficial avenues of economic cooperation. Disclosing this, an official spokesman said that this MoU was signed in the presence of Punjab Deputy Chief Minister Mr Sukhbir Singh Badal and Kathleen Wynne, Premier of Ontario by principal secretary industry and commerce Anirudh Tewari and Helan Angus deputy minister, ministry of citizenship immigration and international trade here at Punjab Bhawan today.This bilateral agreement would focus on exploring opportunities of doing business and investment in Ontario and Punjab through seminars, exchange of ideas by industrialists on both sides through trade missions and delegations besides getting to gain knowledge about core sectors ensuring rapid economic development of both regions. 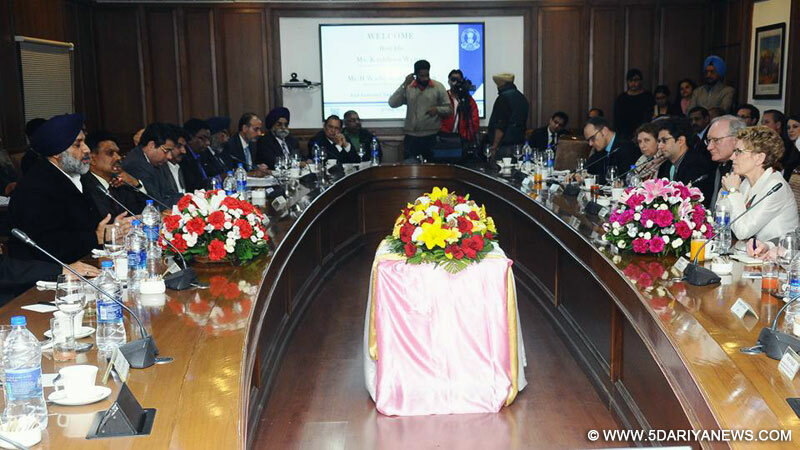 Speaking on the occasion, Deputy Chief Minister Mr Sukhbir Singh Badal expressed satisfaction over the keen interest shown by the delegation to explore the sectors including smart city and developing infrastructure in the state besides exchanging expertise in various fields by both the states in emerging areas. The Deputy Chief Minister said that emphasis would also be laid on exchanging expertise in skill development- a field in which Punjab is emerging as a major player. He expressed confidence that members of Punjabi Diaspora settled in Canada would take this opportunity to invest in Punjab.Terming Punjab as a hot favorite destination for investment, with two successful progressive Punjab Investor summits, S. Sukhbir Singh Badal said that present Punjab Government has facilitated establishing new business ventures by setting up Invest Punjab, which is a one stop place where businessmen desirous of making investments have to submit one application for acquiring all necessary clearances instead of making rounds of multiple departments.Terming MoU signing as a historic step forward in boosting economic co-operation between Ontario and Punjab, S. Sukhbir Singh Badal expressed hope that such level of exchange and co-operation would scale further heights in near future. The deputy chief minister offered to invest in food processing sector as Punjab has declared tax free regime for food processing units. He also informed that state has decided to provide cheapest power besides other incentives to upcoming units. He said that this MoU would herald a new era of co-operation to both Ontario and Punjab with specialized focus on core sectors of urban infrastructure (including environmental technologies, clean/renewable energy technologies, intelligent transportation technologies), information and communications technology (ICT), advanced manufacturing in automotive, food manufacturing and processing, agriculture including technology and skills training and development, education and skills development.On this occasion, premier of Ontario, Ms. Kathleen Wynne offered to form a joint team of both provinces to explore potential areas where investments could be made and expertise could be shared. She lauded implementation of governance reforms by Punjab government and simplification of procedures to set up new industries and infrastructure. She also offered further co-operation in strengthening relationship between two provinces. Prominent among other those were present on the occasion included Mr. Wade Mac lauchlan premier of Prince Edward Islands, Mr Michael Chan minister for citizenship immigration and international trade, Mr. Karim Bardeesy deputy principal secretary to the premier, Ms. Lynn Betzner deputy minister intergovernmental affairs, Mr. Harinder Takhar member parliament, Mr. Christopher Gibbins consul general of Canada Chandigarh, Mr. Jens Michael Schaal Ontario representative in India, Ms. Leslie Marchant director, international relations, Dr. Pramod Kumar Chairman PGRC, Mr Jangveer Singh Media Advisor to Deputy CM, Mr. Rahul Tewari and Manvesh Singh Sidhu both special principal secretaries to Deputy CM, Mr DK Tewari MD Punjab Sewerage and water supply board and NPS Randhawa director Tourism and cultural affairs.